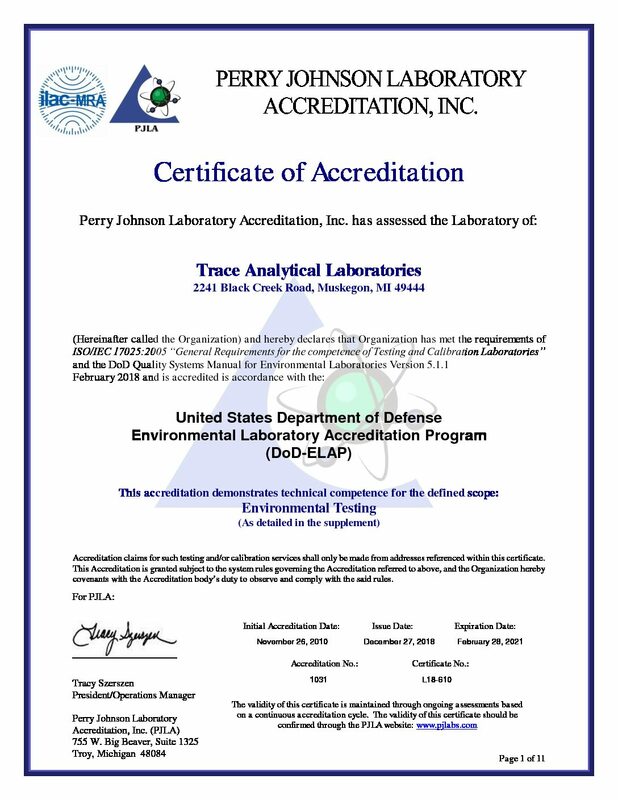 Certifications - Trace Analytical Laboratories, Inc.
DoD-ELAP accreditation provides a means for environmental laboratories to demonstrate their continued compliance with stringent QA/QC requirements. ISO/IEC 17025:2005 is a general standard set forth to recognize laboratory competence in carrying out analyses. 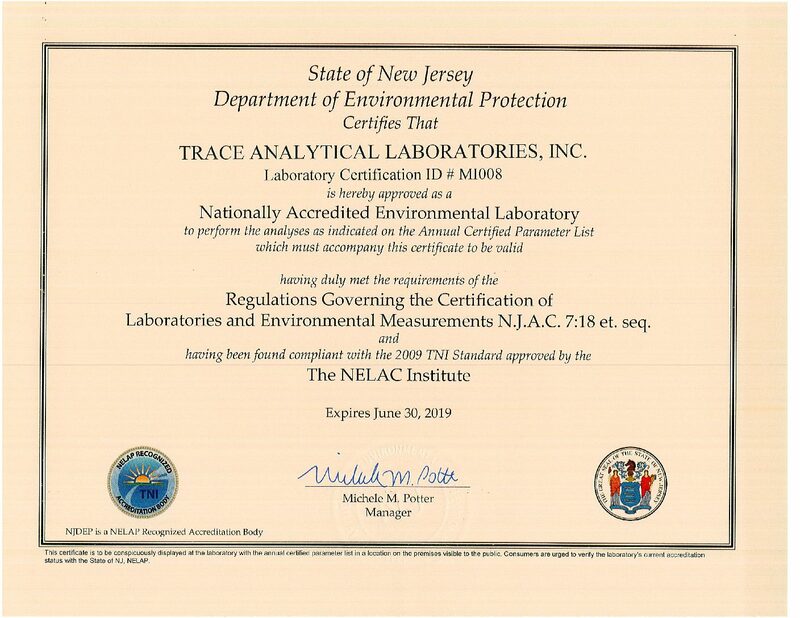 Trace holds these certifications through Perry Johnson Laboratory Accreditation, Inc.
NELAP accreditation approves Trace as a Nationally Accredited Environmental Laboratory meeting the requirements of N.J.A.C. 7:18 et. seq. and having been found compliant with the 2009 TNI Standard approved by the NELAC Institute. The State of Michigan Department of Environmental Quality, Remediation & Redevelopment Division has evaluated and approved Trace for the following parameters for the analysis of drinking water: Inorganic Chemitry: Antimony, Arsenic, Barium, Beryllium, Cadmium, Chromium, Lead, Nickel, Selenium, Thallium, Sodium, Copper Mercury, Cyanide, Nitrate, Nitrite, \Fluoride, and Sulfate. 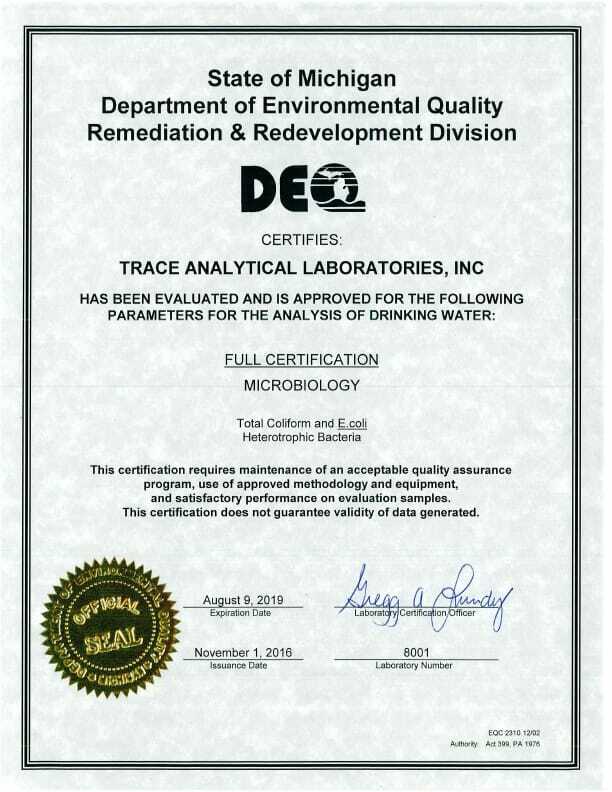 The State of Michigan Department of Environmental Quality, Remediation & Redevelopment Division has evaluated and approved Trace for the following parameters for the analysis of drinking water: Microbiology: Total Coliform and E.coli Heterotrophic Bacteria. The State of Michigan Department of Environmental Quality, Remediation & Redevelopment Division has evaluated and approved Trace for the following parameters for the analysis of drinking water: Organic Chemistry: Total Trihalomethanes, Regulated and Unregulated Volatile Organic Chemicals. © 2019 Trace Analytical Laboratories, Inc.. All Rights Reserved.